1. White labeling boosts the visibility of your brand. If the business you run requires you to offer multiple services or products from third-parties, paying extra for white labeling on all the products you offer is a great way to proliferate your brand name without being obnoxious, increasing the public’s awareness of your brand. 2. White labeling strengthens the loyalty of clients. Obviously the third-party products that you’re white labeling and adding to your offering are dependable and satisfactory (at least they’d better be!). Every time a client uses your white labeled product and sees your name attached, they will associate it with convenience and quality and their loyalty to your brand will increase. 3. White labeling allows you to take advantage of expert work. If third-party developers have the focus and expertise to make a product better than you can, just pay them them for the white labeling privilege and enjoy slapping your brand name on their quality work. 4. White labeling provides your brand with a refined product. Most third-party tools have already gone through beta tests, revisions, troubleshooting, and many other fine tuning processes. Rather than going through the growing pains of launching your own product, you can use an already-polished product with your name attached. 5. White labeling saves you time and money. Creating your own product from scratch might sound like a great idea at some point, but unless you’ve done it (successfully) before, you probably aren’t aware of all the energy and resources that go into creating an original product. Why waste time reinventing the wheel when you can white label? 6. It gives you the luxury of choice. White labeling opens up a world of product options for your business. Run a restaurant and want to offer your guests a house wine? There are hundreds of vineyards out there that would love to have a regular bulk buyer, so you can pick and choose from the many until you find the perfect wine for your label; and this is an example of a common scenario in every industry. Don’t waste time developing a single product when you can white label and choose from many options. 7. White labeling takes the pressure off. If something goes wrong with a product or a client complains, most third-party tools will take responsibility and work on a fix or update for the service or refund the cost of the product. It’s up to you to choose a quality product from a third-party that offers dependable support, but once you do you can sit back and enjoy offering your clients a great tool while someone else does the troubleshooting. 8. White labeling is like having an in-house developer, for a fraction of the cost. Maybe you really like the idea of building your own product, but you probably also like high profit margins. If you develop your own product, you are looking at investing tons of money and time, with no guarantee of the final product’s ROI. When you use a third-party tool and white label it, you’re retroactively paying developers or manufacturers to create a product for your business. And of course, paying for white labeling is a whole lot cheaper than paying a developer to build you a product. White labeling is worth the cost! White labeling allows you to stand on the shoulders of talented developers, provide your clients with excellent products, and maintain a high ROI, all under the name of your own brand. 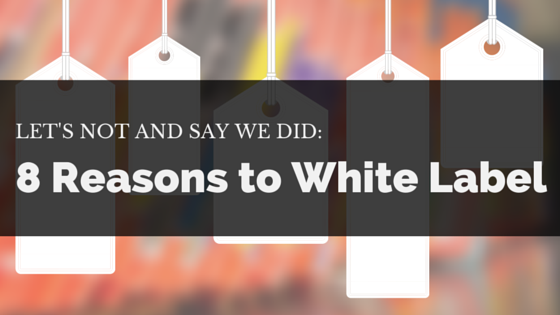 We think those are excellent reasons that show white labeling is worth every penny. We’re happy to say that SkyStats offers white labeling! Premium users already have the white label feature and free users can get access by upgrading. Premium plans for the business dashboard start at only $25/year, which is totally worth it if you don’t want to build your own but would like it to look like you did!